In Opportunity Alabama a rifle echoes throughout the auditorium, the silhouette of Tyler Browne is a solitary figure amidst the anarchy. 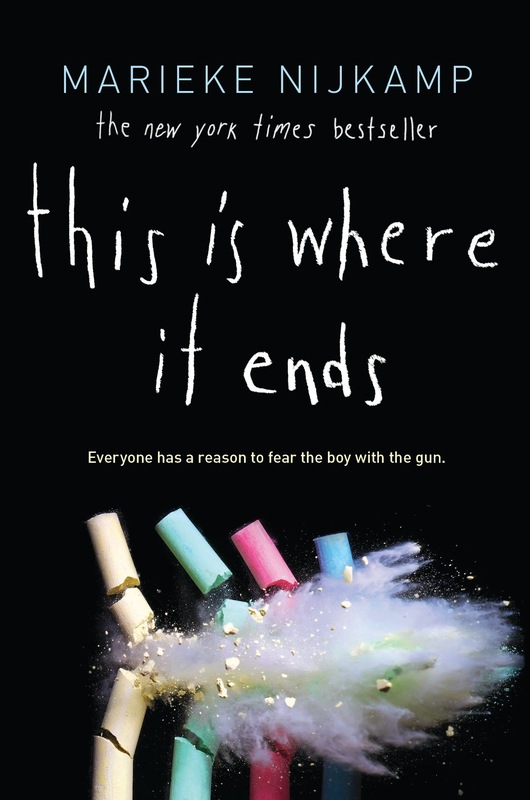 Firearms legislation is a precarious discussion within the United States, in the aftermath of domestic terrorism and This Is Where It Ends explores similar themes. Tyler and Autumn Browne lost their mother to road trauma, their grieving father a physically abusive alcoholic. Autumn intends to emulate her mother, an acclaimed dancer. Defying her father, Autumn aspires to attend Juilliard, escaping Opportunity and leaving Tyler behind. Tyler is volatile, despising Autumn's relationship with Sylvia and accusing Sylvia of manipulation, both present within the auditorium. And I know the auditorium may be big enough to hold a thousand students, but it's too small to hide just one. The reticulated narratives were captivating, illustrating the experiences of Autumn and Slyvia within the auditorium, Tyler's former girlfriend and athlete Claire and Sylvia's brother Tomás. Claire's younger sibling is inside the auditorium. As a child, Matt was diagnosed with lupus, an autoimmune disease which now requires a walking aid. Tomás and Fareed are incredibly courageous. Outside of the auditorium, the young men call emergency services while the onslaught continues behind the barricaded entrances. Together we could be so strong, but the gun has made us individuals. Firearms statistics are disquieting in the United States, caucasian domestic terrorists often portrayed as misunderstood or mentally unwell. Tyler Browne felt one dimensional. The narrative theorises possible motives based on Autumn, Sylvia, Claire and Tomás with no singular reasoning behind why Tyler had chosen to seek revenge other than feeling abandoned. Tyler's character is without a perspective, which I partially appreciated as the narrative of This Is Where It Ends centralises the story of survivors and lives lost to firearm violence but disappointed the physiological aspects weren't explored. Autumn, Sylvia, Tomás and Claire are indistinctive and share similar emotional responses. Anxious although resolute to become the heroic saviour. Fareed is an interesting character who may have offered a differing perspective and the Spanish exclamations a little cliché. 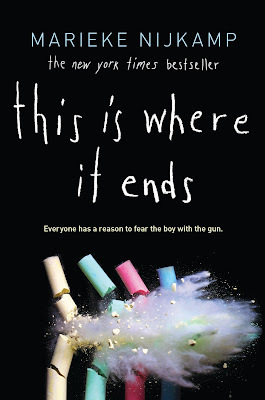 Although monochromatic, This Is Where It Ends is a confronting narrative and a compelling read. Yours is probably the most positive review i've read of this book yet. They've all said similar things, that it could have been brilliant but fell flat, lacked character depth etc. etc. I feel like the author was really trying to highlight the devastating and horrific effects of school shootings, but maybe didn't quite hit the mark. Nevertheless people are reading, and thinking and talking - and that's so important if anything is going to change. I actually preferred that Tyler wasn't given his own perspective, it created a narrative of victims and survivors, giving them voice. Wow!! So much going on but it sounds so powerful! It sounds amazing!!! The writing style of the author sounds beautiful! It's an emotional and incredibly poignant read Haniya, I would love to see what you think of it. Ultimately it's about survival Vanessa which also felt very monochrome. I appreciated that it didn't assume that the act of terrorism was due to Tyler being mentally ill, which seems to be the case with mass shootings in the American media. A very powerful read. I remember when this came out, I was interested then. i actually got a free copy a while back but never got around to reading as it's on ibooks and I rarely read books on my ipad. I do remember seeing a review saying something similar to you, that some of the characters sounded similar and they weren't distinct enough which is annoying. I do think it's an important issue to write about, though, especially in the US where gun control laws are insane. They truly are. In Australia we begun a firearms amnesty after a mass shooting and that was the last mass shooting in Australia, so control works despite what rifle clutching Americans may believe. This is one of those books where the discussion extends past the storyline and characters and ignites important discussions as well. I cried when I finished reading this book. I didn't know what to expect when I read it, but I was very impressed with it. It feels like such a foreign concept as Australian's doesn't it Verushka. The intensity of being at the mercy of someone so unpredictable who has the power to end your life. I was a mess. I think a lot American readers have probably become desensitised to gun violence. I do want to read this one. It focuses on a tough, but important topic. Gun violence in the U.S. is horrible - and especially in terms of white men. Of course, peopled o want to say they are just mentally ill or disturbed, and maybe they are, but if the person is anything other than white, they are immediately a terrorist and the difference isn't fair...as odd as that might sound, talking about murderers. thanks for sharing. I'm glad you liked this one for the most part. I can't recall any mass shootings in recent years where the shooter has been a woman either. Strangely the media always portray the white male gunman as a lone wolf who was mentally ill. What about toxic masculinity? Surely that plays a part in why these white men wake up that morning and decide to take as many lives as possible. It seems easier for them to say this person did this and that was his issue, rather than he did this and this is a community issue. Probably the same reasoning why they continue to clutch their guns while children are being gunned down at school. Thanks Topaz, I really appreciate your kind words. I haven't heard of that one but will definitely be picking up a copy. Mass shootings are such a foreign concept to most Australian's nowadays so it was incredibly confronting for me as a reader. Thanks Zoe and it seems readers have been fairly split with this one hasn't it. I think it'll have a greater impact with non Americans.